Our research is focused on the properties of superfluid 3He at ultra-low temperatures. The superfluid phases of 3He are the best experimentally accessible examples of topological superfluids, which share many properties with popular topological insulators and superconductors. We are interested in particular in emergent fermion zero energy modes, like Majorana fermions at the surfaces and in the cores of the topological defects of the order parameter. The dynamic behaviour and interaction between objects of different topologies are also investigated. Our group studies the dynamics of quantum matter in a rotating refrigerator. We use superfluid 3He as the substrate. Our cryostat can cool 3He in rotation to lower temperatures than any other refrigerator in the world, below 140 µK. One of our main research topics is studying topological defects in superfluid 3He. An example of such defects are quantized vortices. 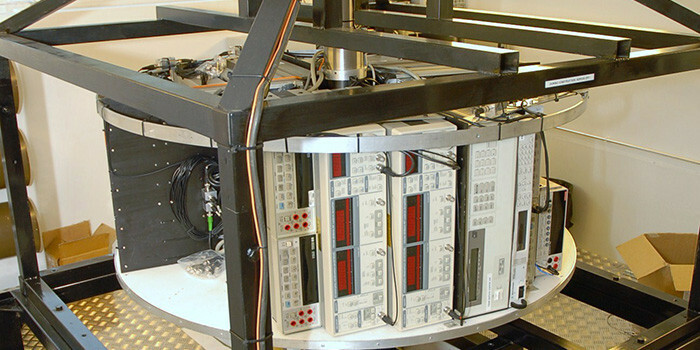 The dynamics of these objects are probed using non-invasive NMR (Nuclear Magnetic Resonance) and mechanical oscillators. We study dynamic processes such as vortex motion, onset and transition to turbulence, turbulent front propagation, dissipation of turbulence, and the electromagnetic resonances of the 3He superfluid order parameter.